Hey Democrats, want help to rally the country around Donald Trump? Here’s a great idea: Have a crowd of wealthy, out-of-touch Manhattan liberals (who can afford $849 tickets to “Hamilton”) boo Vice President-elect Mike Pence while the cast of the Broadway show lectures him on diversity. The Democratic Party’s alienation from the rest of America was on full display at the Richard Rodgers Theatre on Friday night. And the left seems completely oblivious to how ridiculous it looks to the rest of the United States. Professors at Yale and Columbia universities and other elite schools postpone exams and cancel classes for students who could not deal with the election results. Kids in Washington schools cut class with tacit approval from administrators to march in protest of the results of a free and fair election. School officials in Montgomery County offer grief counselors to “help students process any concerns or feelings they have about the election.” (Funny, I don’t recall anyone canceling exams or offering my kids grief counselors when Barack Obama was elected). People in the American heartland see all this, and they shake their heads in disgust. 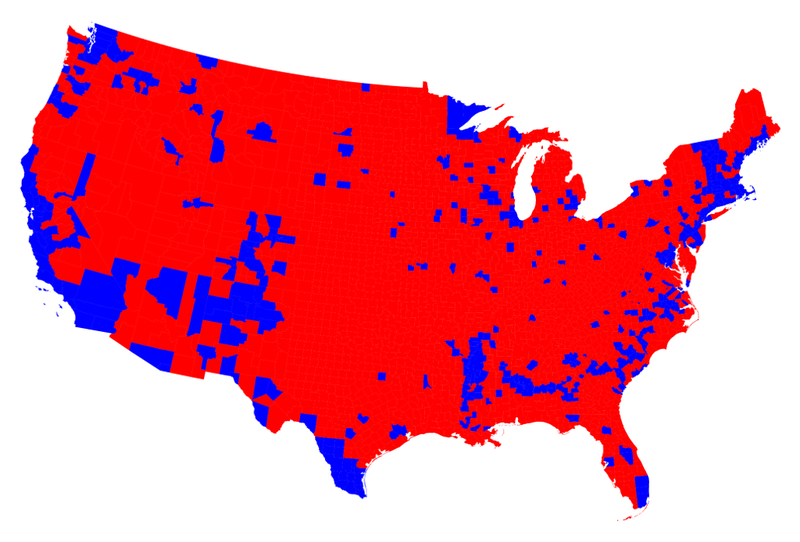 Today’s Democrats have become a party of coastal elites completely disconnected from the rest of America. Doubt it? Take a look at a county-by-county map of the 2016 presidential election. You can drive some 3,000 miles across the entire continental United States — from sea to shining sea — without driving through a single county that voted for Hillary Clinton. At the national level, the Democratic Party has been wiped out. Trump won five states that voted for Obama twice — Iowa, Wisconsin, Ohio, Pennsylvania and Florida — pushing Democrats even further toward the coastal peripheries. As a result, Republicans now control the House, the Senate, the White House, and (after President Trump picks a new justice to replace Antonin Scalia) there will be a restored conservative majority on the Supreme Court. But that is nothing compared with the utter devastation Democrats have suffered in the states. On President Obama’s watch, Democrats have lost a net grand total of 939 state legislative seats, 30 state legislative chambers and a dozen governorships. When Obama first took office, Republicans held just 3,223 state legislative seats. After Tuesday’s vote, the number stands at 4,162. There are now more Republican state legislators than at any time since 1920. And if Gov. Pat McCrory holds on in North Carolina, Republicans will match their all-time high of 34 GOP governors last seen in the 1920s. Or consider this: Today, Democrats control both the governor’s office and the legislature in just five states — Oregon, California, Hawaii, Connecticut and Rhode Island. By contrast, Republicans have total control of state government in 25 states — half the country. If Democrats are smart, they will listen to Ryan. His district includes hurting industrial areas such as Youngstown and Akron — so he understands how to win the very voters Democrats lost in 2016 and need to win back. Do they have a better chance of winning back those voters by electing him or an aging, coastal San Francisco liberal such as Pelosi? Ryan is young and dynamic — just 43 years old. The House Democratic leadership, by contrast, is old. The Post recently reported that the average age of the House Democratic leadership is almost 65 years old. And Pelosi is 76 — a year older than Bernie Sanders. Perhaps Democrats should take the advice of John F. Kennedy and pass the torch to a new generation. The long-term problem for Democrats is that much of that new generation has been wiped out at the polls. We saw the impact of the Democratic collapse in the states during this year’s presidential primaries. The Republican field was brimming with candidates, while on the Democratic side Clinton struggled to defeat a disheveled 75-year-old socialist from Vermont, and the rest of the field — Martin O’Malley, Jim Webb and Lincoln Chafee — could not crack the low single digits. Eight years of losing statehouses and governors’ mansions have left Democrats with no bench. They are like an NFL team with aging stars who are long past their prime and few prospects in the pipeline. Democrats may believe that the way back from the periphery is to follow the advice Aaron Burr offers Hamilton: “Talk less. Smile more. Don’t let them know what you’re against and what you’re for.” That didn’t work out so well for Clinton. If Democrats can’t find new leaders who can connect with the working-class voters they lost to Donald Trump, they may find themselves even more isolated from the American heartland than they are today.